build.prop Editor is an app created by Nathan Campos (whose official website is http://about.me/nathanpc). build.prop Editor has a rating of 3.6 on the Play Store, with 1090 votes. Similar apps are: Root Essentials (by SuperThomasLab), PropEditor (by Ciubex), Advanced Tools (by SCDevs), Kernel Adiutor (by Willi Ye), BuildProp Editor (by JRummy Apps Inc.), Spare Parts Plus! (by DroidGram), Root All Devices (by HEXAMOB S.L. ), Device Control - Root (by Alexander Martinz), ROM Toolbox Pro (by JRummy Apps Inc.), Root Check (by JRummy Apps Inc.), APK Editor (by SteelWorks). build.prop Editor is currently available in the following countries: Peru, Switzerland, Romania, Israel, Turkey, Thailand, Germany, China, Japan, Netherlands, Denmark, Slovakia, Greece, Ukraine, United Arab Emirates, Poland, Estonia, Chile, Australia, Austria, Singapore, Indonesia, Czech Republic, South Korea, Colombia, Croatia, Serbia, France, United Kingdom, Sweden, Latvia, Lithuania, Norway, Finland, Hungary, Belgium, Hong Kong, Spain, Taiwan, Philippines, Malaysia, Russia, Bulgaria, India, Canada, Mexico, South Africa, Italy, Brazil, Portugal, Argentina, Saudi Arabia, United States, New Zealand, Egypt, Vietnam. Got root? This app will let you know if your device has root (superuser) access. PropEditor will help you to edit your build.prop file. 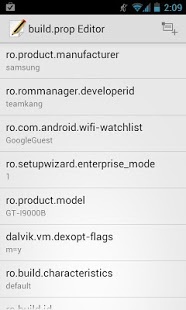 All in one to explore, manage and set-up your android device!